Peanut Gallery: If you haven’t discovered Israel’s James Bond, “Gabriel Allon,” then you’re in for a real treat. Silva’s latest book, “The Black Widow,” is #16 in the series. The Black Widow will get you hooked; then go back and read them in order. Enjoy! 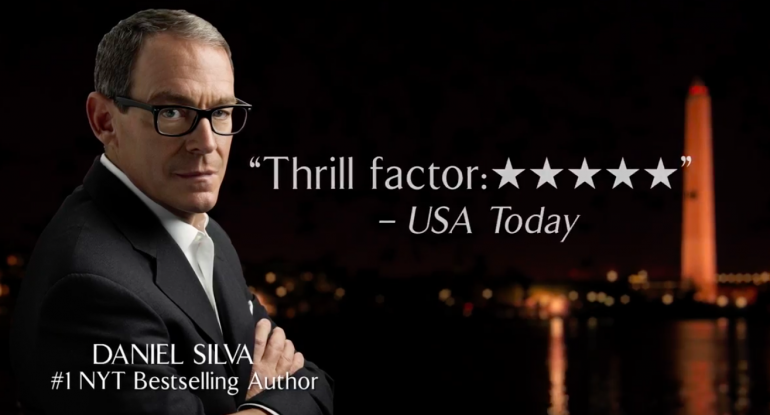 Daniel Silva is among the finest and most compelling writers in the suspense/intrigue/espionage/thriller genre in modern fiction, which has its share of brilliant or engaging practitioners—Ian Fleming (of course), John LeCarré, David Baldacci, Jo Nesbo, James Rollins, Kathy Reichs, Steve Berry, Donna Leon, Tom Clancy, Jonathan Kellerman, Mons Kallentoft, Louise Penny, P.D. James, Michael Gruber, John Burdett, Trevor Ferguson (aka John Farrow) and, yes, Dan Brown, to name a few of the most prominent. Silva is a charter member of this elect fraternity, one of the genre’s best-selling authors, whose area of expertise is the Middle East, the Palestinian terror machine, Iran’s nuclear ambitions, the Russian involvement in the region, the ambitions of Islamic jihad around the globe, and, of course, the efforts of Israel’s intelligence agency, the Mossad, to counter these manifold threats. Indeed, Silva’s knowledge of the Middle East imbroglio is second to none and his plots are invariably timely, impinging on the cultural, political, and military realities of the present day. His most recent offering, The Black Widow, may well be his most topical and profoundly analytical work. All the salient elements of the international arena, real and imagined, are there: ISIS and the caliphate; drone warfare; the dissolving border between Iraq and Syria; the disintegration of Lebanon; the collusion of Turkey; a succession of catastrophic attacks in Paris, Amsterdam, and Washington, the latter on the scale of 9/11; a feckless and narcissistic American president plainly inadequate to the burden of high office; the dysfunctional character of American and European national security; and the comparative effectiveness of the Mossad. The book and the world intersect at every point. It is interesting to note that Silva’s novels are tailor-made for the Hollywood film industry, yet not one has appeared in the theaters. It is not difficult to see why. As in real life, his terrorists are Muslims, members of a socially protected species. When it comes to the entertainment industry, a toxic amalgam of abject pusillanimity and leftist sympathies, along with dark infusions of Arab cash, has had its predictable effect on filmic integrity and patriotic sentiment. One recalls that the movie version of Tom Clancy’s The Sum of All Fears transforms the novel’s villains, a sect of actual Palestinian terrorists known as the PFLP, into a collection of Austrian fascists—safe, acceptable bad guys. Given their inseparable interweavings with geopolitical reality, Silva’s plots are thankfully immune to such deceptive meddling. Timorous and morally compromised, Hollywood will not violate the shibboleths of the day or offend its twin masters: progressivist culture and Islamic money. As usual, the iron grip of political correctness is, well, iron. The same wariness is true of our literary critics who are often careful to hedge their bets. Robert Fulford, for example, a belvedere eminence for the National Post, penned a laudatory review of The Black Widow, but could not help pressing the right virtue-signaling buttons. Silva’s fascinating hero, Israeli operative and future head of the Mossad Gabriel Allon, may be “the James Bond of Israel.” Nevertheless, though sympathetic with Allon’s fight “for his country’s future existence,” Fulford considers it necessary to comment in passing that we “see everything from the standpoint of the Israelis,” as if we didn’t see everything from the standpoint of the British in the Bond novels, or from the perspective of the Americans in Berry’s works, or of the Thai in Burdett’s Sonchai Jitpleecheep series, and so on. He plainly would not have felt obliged to qualify his approval had there been any other national polity in play. ‹ Morning Prayer: Wed, 04 Jan – 1 John 3:7-10; Psalm 98:1, 7-9; John 1:35-42 ~ who’s your daddy?